Semi-ripe cuttings are an easy way to propagate a wide range of hardy climbers, herbs, ground-cover plants, shrubs and trees – especially evergreens – without the need of special equipment or skills. Taking a semi-ripe cutting. Credit:Tim Sandall/RHS The Garden. Climbers, including ivy, passion flower, Solanum and Trachelospermum, lend themselves to semi-ripe cuttings. Evergreen shrubs such as Artemisia, Berberis, Brachyglottis, Camellia, Ceanothus, Choisya, Cistus, Convolvulus cneorum, Erica, Hebe, Fatsia, Mahonia and Viburnum. Groundcover plants including Lonicera pileata, periwinkle, Rubus tricolor and Rubus calycinoides. Hedging plants such as box, cherry laurel, Escallonia, holly, Lonicera nitida, Portuguese laurel and privet. Herbs including bay, hyssop, lavender, rosemary, rue, sage and thyme. Trees that can be propagated as semi-ripe cuttings include Magnolia grandiflora and holly, as well as many evergreen conifers. Semi-ripe cuttings are selected from this season’s growth. The base of the cutting should be hard, while the tip is still soft. This material is available in late summer until mid-autumn. Avoid damaged, unhealthy, over-vigorous or atypical material, selecting shoots that are more horizontal in habit with short internodes (gaps between the leaves). To produce suitable material for semi-ripe cuttings, hard prune unproductive stock plants in spring to stimulate new growth to take cuttings from. It is worth noting that, before mid-summer, propagate by taking softwood cuttings. And, after mid-autumn, the wood hardens, so take hardwood cuttings then. Choose healthy material that is free of pests and diseases and remove it with sharp, clean tools. It is best to take cuttings in the morning to avoid wilting. The basic method cuts just below a leaf to leave a prepared cutting of 10-15cm (4-6in) in length. Heel cuttings (where the cutting is pulled away with a piece of the stem) can be used – Ceanothus and Berberis are commonly propagated from heel cuttings. Basal cuttings are where the shoot is severed at its base. There is often a slight swelling here and the cut should go through this area. Brooms respond well to this method. Mallet cuttings are sometimes used for Mahonia. Each leaf is planted as a cutting, burying it with a piece of stem attached. 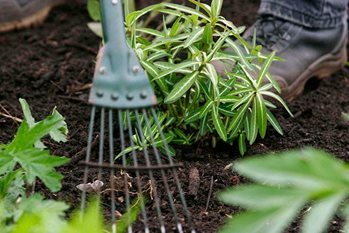 Select the cuttings from this season’s growth and remove them using sharp secateurs. Place the cuttings in a plastic bag straight away. Keep the bag in the shade or, in hot weather, the fridge until you are ready to prepare the cuttings. However, aim to pot the cuttings within 12 hours. Prepare the cuttings by trimming them to 10-15cm (4-6in) in length, cutting just below a leaf node. Next, remove the lowest leaves and the soft tips. There will usually be about four leaves remaining. Dip the bottom of the cutting in fresh hormone rooting powder, ensuring that the cut is well covered. Tap gently to remove the excess. On large-leaved shrubs, cut the leaf in half to reduce water loss. For difficult-to-root shrubs, such as Magnolia grandiflora, try ‘wounding’. This is the removal of a sliver of bark 2.5cm (1in) long on one side of the stem at the base. Insert the cuttings into suitably-sized containers filled with cuttings compost – use 50 per cent free-draining potting compost mixed with 50 per cent sharp sand or perlite. Water well and allow to drain. Place the container of cuttings in a greenhouse. Alternatively, cover pots with a plastic bag and put in a warm, light position, out of direct sunlight. Remember to remove excess moisture, but keep compost damp. Cuttings taken in summer seldom need bottom heat but by autumn cuttings root more quickly in a heated propagator. Hardy shrubs can also be rooted directly in the soil, ideally enriched with plenty of organic matter, in cold frames or low tunnels of polythene sheeting, but may not root fully until late spring the following year. Ensure that the compost remains moist until the cuttings are well rooted, shading the greenhouses and cold frames in hot weather. Remove any dead or diseased cuttings that appear. Additionally, for cuttings in outdoor beds and cold frames, remove any fallen leaves. Cuttings rooted in greenhouses and propagators will need hardening off for two to three weeks before potting on or planting. Cold frames, unheated greenhouses or even under horticultural fleece are good places to harden off. Fungal moulds and rots can cause severe losses. Fungicide dips are no longer available, but regularly removing diseased material and ensuring good ventilation to help remove excess moisture (without allowing the cuttings to wilt) can help.